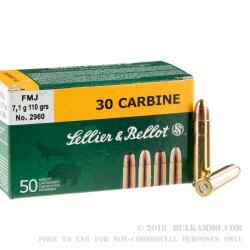 Sellier & Bellot’s long history of providing top quality 30 carbine military rounds built to mil specifications numbers but made for the civilian market, means they have dialed in something special for the price point with this .30 Carbine ammunition offering. This is a full metal jacket 110 grain projectile that aligns itself with the classic military loadout from the Vietnam War era. The confident brush gun cartridge was a great addition to the dense, leafy jungles of Vietnam, Cambodia and Laos, where most of the fighting took place. 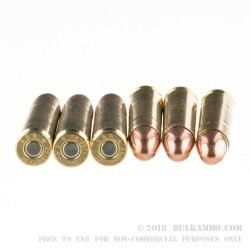 The solid full metal jacket and the good velocity as well as the round nose meant that the leaves were able to be barreled thorough, instead of deflecting the projectile, like it did often with the 5.56x45 round. 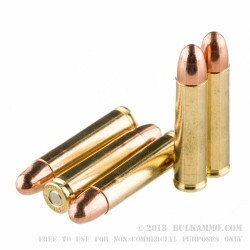 Today, the same concept rings true, as this round is an excellent cartridge for use in hunting intermediate sized game in dense forested areas where the small faster moving projectiles just can’t compete, performance wise with the heavier, rounder projectile. The brass case and Boxer primer means this is a reloadable cartridge, and the S&B brass is of top quality. 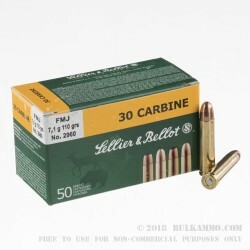 This is suitable in all firearms that are chambered for the .30 Carbine cartridge.